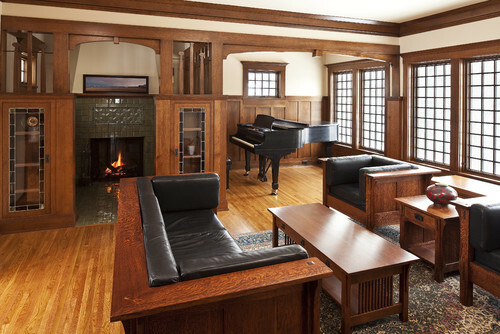 The Craftsman style became a popular choice in housing design during the early part of the 20th century. It reached its peak somewhere around the 1920s, and then lost momentum drastically, with many of these homes coming from a Sears catalog. However, this style saw a surge once again during the end of the 20th century, and has maintained a relatively high volume through today. Once you have been exposed to a Craftman style home, there are certain identifiers that are clear giveaways to the design that cannot be missed or mistaken for any other style. 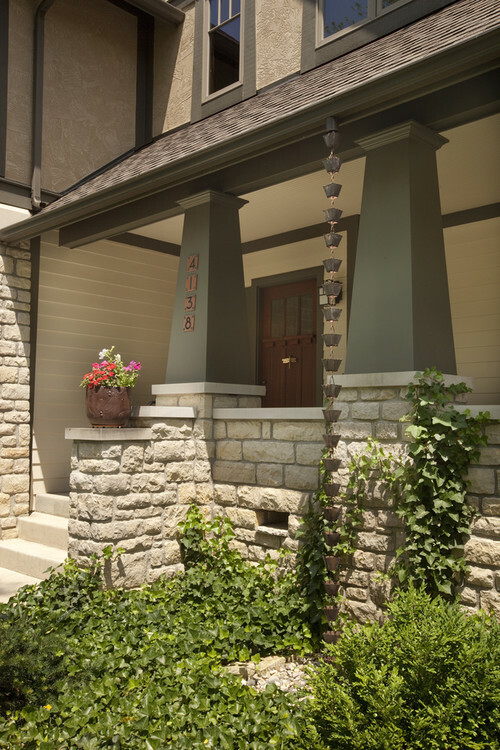 The exteriors of a Craftsman house has several of these identifiers. One of these most commonly seen identifiers is the use of tapered columns, usually resting on a platform of bricks or stone. 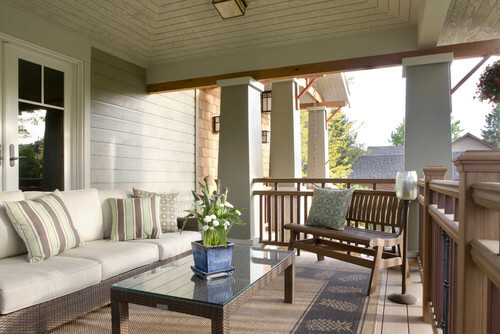 Another beautiful aspect of the Craftsman home is the expansive steps leading to a front porch. Most of the time, these porches are quite large. 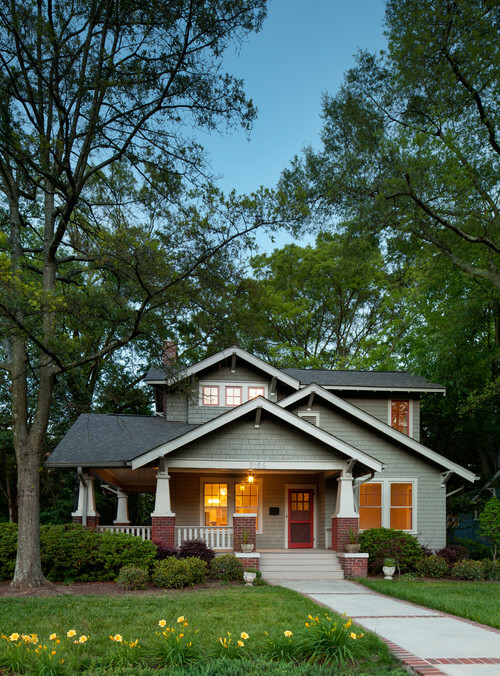 This is a beautiful example of a Craftsman porch. Notice in this example that the columns do not rest on bricks or stone, but instead sit directly on the porch itself. 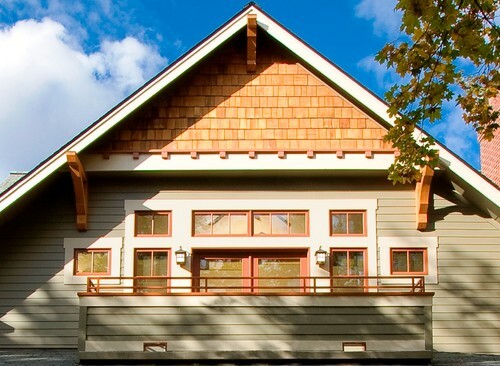 Craftman homes commonly have deep eaves and exposed rafters. They also frequently display gabled roofs with knee braces. The knee braces may be functional in nature, providing support for the gabled roof, or they may be purely decorative. 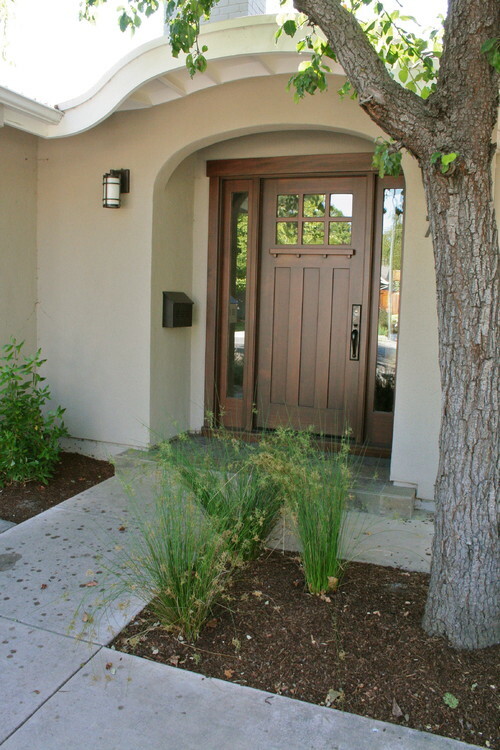 A classic styled Craftsman door is a show piece in and of itself. 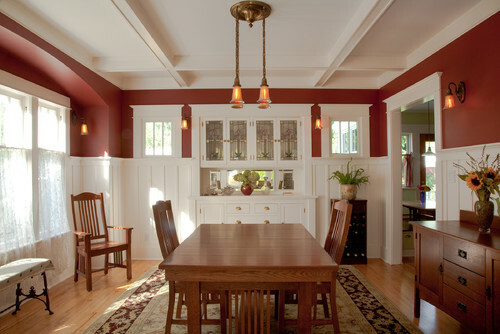 These doors feature a ledge that is usually trimmed out with dentil molding. Above the ledge is a window divided into lites, usually three but sometimes six. Below the ledge, the door boast three panels. These doors are gorgeous with just a stained finish, but can create quite a statement when a bright paint color is added. 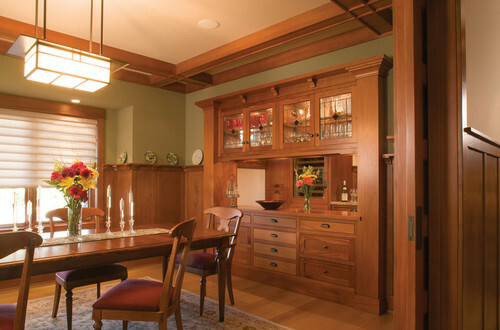 The interiors of a Craftsman home exudes craftsmanship. With materials that consist of woods and natural stones, these homes shout strength and stability. The attention to detail is shown in the art of the structure. You will not find ornate embellishments here, but embellishments are not needed. The intricate craftsmanship is more than enough to create a show place. 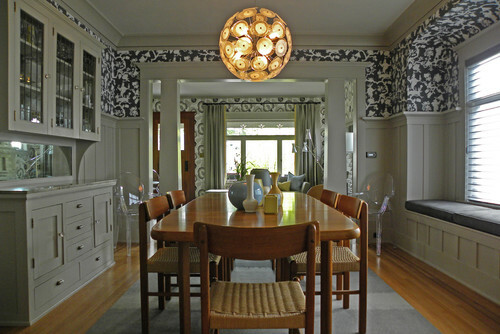 The Craftman style brought informality and family togetherness into the kitchen. Gone are the formal kitchens of the Victorian style. In its place is the eat are kitchens that frequently boast a banquette area. Materials in a Craftman consists of wood, stone, and tiles. The wood is generally Oak; however, a few other types of wood are acceptable, as well. 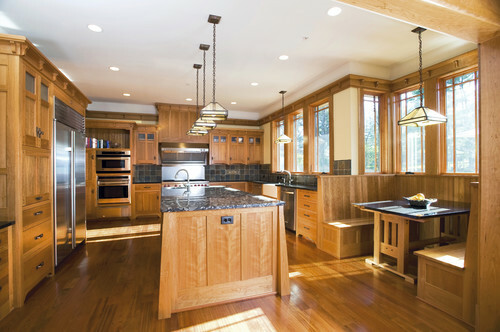 This wood is used throughout the home – covering walls in board and batten, providing flooring and trim, and constructing the cabinetry. 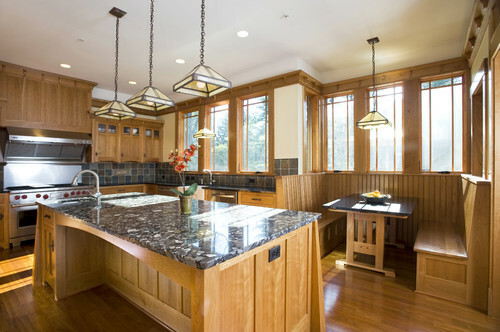 Leaded glass and stained glass windows are common place. These features are also carried into the rooms of the house by way of glass door bookcases and built ins. Almost all Craftmans will have a built in book case of some sort. Generally, they will reside next to the fireplace. Othertimes, they will serve as room dividers resting beneath the same type of tapered columns that can be found on the exterior. Although, a traditional Craftman shows off its abundance of oak wood, finished out in just stain only, today’s Craftmans have begun to incorporate painted woods into the mix. Here, someone has updated the oak with a dark shade of paint. But, today’s Craftman more often have a lighter painted finish throughout. This allows a wood other than oak to be used during construction. Here, while the trim and molding of the house have been painted in a bright white, the oak element has still been incorporated into the design by using oak furniture and flooring. The Craftman home is a popular choice for DIYers who wish to purchase a fixer upper. It also is much loved by many seeking new construction. 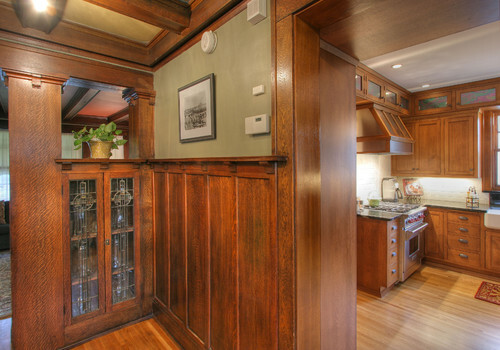 To have an authentic Craftsman, stick to these feature details, and you will be happy. However, a unique personal touch can be added quite easily with finishing and decor. So, what do you think? Love it or hate, is this style for you?